Home › entertainment › Stories › Police Officer Pulls Over 5 Old Ladies. Why? I Can't Stop Laughing! 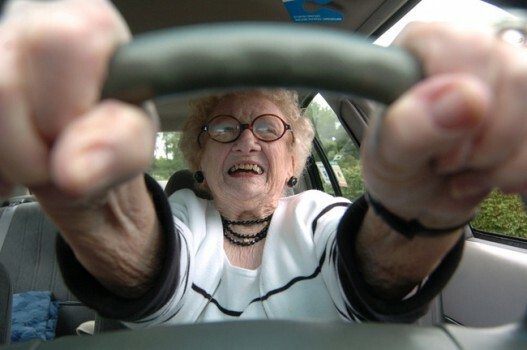 Police Officer Pulls Over 5 Old Ladies. Why? I Can't Stop Laughing! Sitting on the side of the highway waiting to catch speeding drivers, a State Police Officer sees a car puttering along at 22 MPH. He thinks to himself, this driver is just as dangerous as a speeder!” So he turns on his lights and pulls the driver over. Approaching the car, he notices that there are five old ladies — two in the front seat and three in the back — wide eyed and white as ghosts. 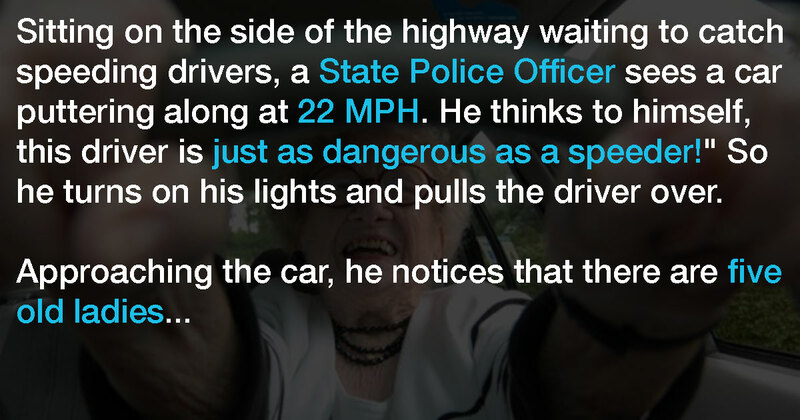 “Slower than the speed limit? No sir, I was doing the speed limit exactly… Twenty-two miles an hour! “The old woman says a bit proudly. The State Police officer, trying to contain a chuckle explains to her that 22″ was the route number, not the speed limit. A bit embarrassed, the woman grinned and thanked the officer for pointing out her error. But before I let you go, Ma’am, I have to ask… Is everyone in this car OK? These women seem awfully shaken and they haven’t muttered a single peep this whole time,” the officer asks. Please SHARE this funny joke if it made you laugh!